When you stir a cup of tea, the surface of the rotating liquid develops a dip in the middle. The faster you stir, the deeper the dip. But the liquid surface is quite uneven; to get a smooth surface, throw the spoon away and spin the whole cup continuously. Once the liquid inside has caught up with the cup, and everything is turning at the same speed, the liquid surface forms a beautiful smooth curve known as a paraboloid of revolution. Sarah McLeary and I are applying this idea to make thin paraboloidal plaster shells. We spin a bucket on a potter’s wheel (Sarah is a potter), and pour plaster into it. The plaster rapidly flows until its surface forms a deep paraboloidal curve, and then sets. We now use this cast, still spinning, as a mould, and cast a thin layer of plaster inside it, to make a paraboloidal shell. That’s our first attempt above. It’s about 20 cm across and 3 mm thick. It might look like a part of a sphere, but in a profile view it’s easy to see that the curvature is tightest at the base and gradually decreases up the sides, as you’d expect for a paraboloid. I love the fact that we didn’t decide what shape this shell was going to be: physics did. There’s lots of experimentation ahead. When we’ve got the hang of it, I’ll explain our methods in more detail. But as this picture of our third attempt shows, we haven’t quite cracked it yet. This image is my version of Edward Adelson’s checkershadow illusion (with a little inspiration from Magritte). It’s a photograph of a real, physical scene. Take a look at the central square of the checkerboard, and the square indicated by the arrow. Which is lighter? Quite clearly, it’s the central square, isn’t it? Remarkably, the central square actually emits less light than the square indicated by the arrow! You could use a light meter to check this claim, but it’s easier to verify it directly by using a piece of card with two holes cut in it to mask off the rest of the image. Some people will tell you that this image shows you how easy it is to fool your brain. But it does the exact opposite: it shows you what a marvellous piece of equipment your brain is. Think about the checkerboard itself, and the materials it’s made of. The arrowed square is coated with dark grey paint, and the central square is coated with light grey paint—and that’s exactly what you perceive. The shadow cast by the pipe means that the light-grey central square is more dimly lit than the dark-grey arrowed square, so much so that it actually reflects less light into your eye than the arrowed square. But your brain cleverly manages to determine the actual lightnesses of the physical surfaces, despite the uneven lighting. Isn’t that a good thing for your brain to do? If you still don’t believe me, try this thought experiment. Imagine that you live in a forest where there are two kinds of fruit. One is light grey and poisonous, and the other is dark grey and nutritious. Two of these fruits hang next to each other, but in the dappled forest light the (light grey) poisonous fruit is in shadow, and the (dark grey) nutritious fruit is in bright light. Suppose that the depth of the shadow is such that the light-grey poisonous fruit actually reflects slightly less light into your eye than the dark-grey nutritious fruit, just as with the two squares in the picture above. Would you really want your vision to tell you that the poisonous fruit was the dark one and therefore the one to pick? Or would you want it to discount the irrelevant effect of the shadow and tell you which fruit was actually dark and which was actually light (and would kill you)? I know what I’d want. I think that it is wrong to call this effect an illusion (and so does Adelson). There is nothing illusory about what you see. You perceive the useful truth about the scene in front of you. How fast does a plucked guitar string move? It’s a complete blur, so surely it’s travelling at a terrific speed. 50 miles per hour? 100 miles per hour? What do you think? 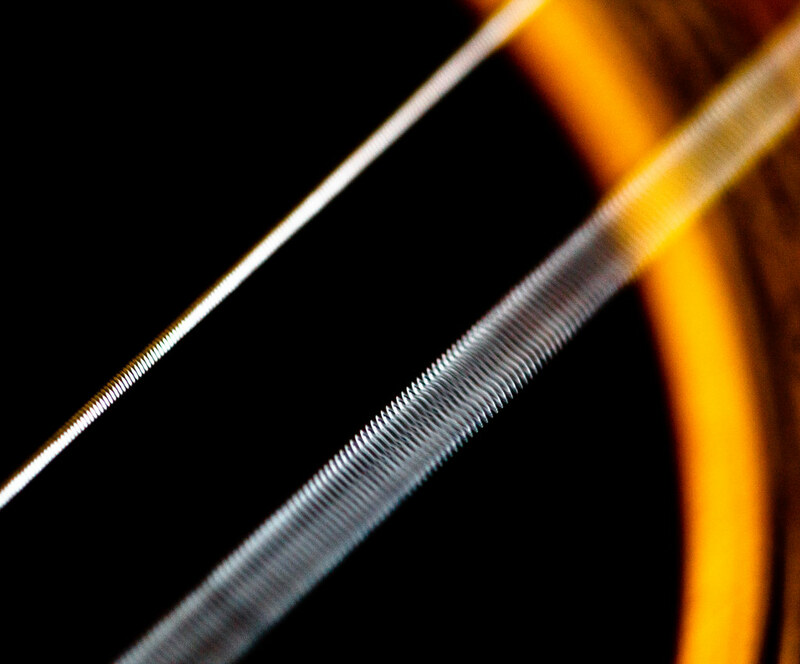 “Vibrating guitar string” by jar. See end of post for full attribution. Walking pace. A typical speed for the middle of a guitar string given a good twang is walking pace. And that’s the middle of the string. Near its ends, it’ll be moving much more slowly. How can that be so? Well, although the string is going back and forth hundreds of times a second, it’s only travelling a few millimetres on each trip. So the distance that it travels in each second isn’t as much as you might expect. It certainly isn’t as far as I expected. If you think that the string moves slowly, what about the body of the guitar? The string itself radiates very little sound into the air; its job is to set the body of the guitar vibrating. The body of the guitar, with its much larger area, is much more effective than the string at setting air into motion. Yet we can’t even see the body vibrating. At what snail’s pace must it be moving? Remember also that the air molecules on which the guitar body acts are already travelling at something like 500 metres per second. Isn’t it astonishing that the sub-pedestrian movements of the guitar affect the movement of the air molecules enough to produce a sound that we can easily hear? Suppose that we look near the centre of the string, where its movement is the greatest. Shortly after being plucked, the width of the blur that we see is going to be something like 5 mm. So for every complete oscillation, the string does a round trip of about 10 mm. The frequencies of the strings on a standard 6-string acoustic guitar are (to the nearest whole number) 82, 110, 147, 196, 247 and 330 hertz (one hertz is one oscillation per second). If we multiply these frequencies by the 10 mm round trip, it tells us how far the centre of each string travels in one second, that is, its average speed. I’ve converted these speeds into metres per second. For comparison, a brisk walk at 4 mph is about 1.8 ms-1. Our brisk walk is right in the middle of this range. And remember, we’ve done the calculation for the part of each string that’s moving the most. Near its ends, each string will be moving much more slowly than this. Complication 1 – how long is the round trip really? So far, we’ve assumed that each part of the string does a simple back-and-forth movement along a straight line, but if you carefully watch a vibrating guitar string you’ll see that the string often moves in an irregular but roughly elliptical orbit. The wire-wound lower strings show this most clearly; you can see a hint of it in the image at the top. This makes the round-trip distance a bit longer than the 10 mm that we used in the calculation earlier. Does this affect the string’s average speed much? We’ll take the extreme case where each part of the string moves at constant speed in a circle of diameter 5 mm rather than along a straight line 5 mm long. The circumference of this circle will be mm, or about 15 mm. So the speeds of the strings (in this rather unlikely extreme case) will be about 50% greater than the ones listed above. They are still hardly impressive. So far, we’ve calculated the mean (average) speed of the string over its round trip. However, unless it’s moving in a perfect circle, its speed changes constantly, and its peak speed will be higher than its mean speed. How much higher? Imagine that part of the string is vibrating back and forth along a straight line in the simplest possible way. At one end of the movement the string is stationary as it changes direction. It then speeds up, reaching its peak speed at the centre of its range of movement. Then it slows down until it reaches a halt again at the other end of the movement and changes direction again. How do we calculate the peak speed if we know the time taken for the round trip? You’ll need to know a bit of maths for the next bit. The simplest vibration of the string is where each part undergoes simple harmonic motion, that is, where its position varies sinusoidally with time. This means in turn that the velocity of the string also varies sinusoidally in time. So we need to ask: how does the mean value of a sinusoid compare to its peak value? We constructed the rectangle to have area . Its width is , so its height, and therefore the mean value of the sine function, is . The height to the peak of the sine curve is 1, so the peak value of the sine function is times its mean value. This means that the peak speed of our guitar string is times, or 50% more than, its average speed. Again, nothing to write home about. It’s sometimes said that if you sit an immortal monkey in front of an equally durable typewriter and leave it to tap randomly away at the keys, then eventually it will produce the entire text of Richard III (or any other Shakespeare play of your choice), completely by chance. All you have to do is wait long enough. I was thinking about this one day, and also thinking about air molecules. In the room I’m sitting in at the moment, there are at least 1,000,000,000,000,000,000,000,000,000 air molecules, all frantically dashing around bumping into each other. How often, I wondered, do little clusters of these molecules fleetingly arrange themselves, by chance, in arrangements that we would regard as being somehow regular or remarkable? I promise you that my simulation didn’t involve any secret forces drawing atoms towards certain positions. The movements and collisions of the atoms all occurred in accordance with the laws of mechanics. But I did cheat a little. Can you figure out how? In case you’re fidgeting on your chair wondering why I started talking about air molecules but finished talking about gas atoms, let me explain. Nearly all of the air is nitrogen and oxygen. Nitrogen and oxygen atoms are essentially spherical. But in the air, nitrogen atoms are bonded together in pairs to form nitrogen molecules that are, roughly speaking, a stubby rod shape. The same goes for oxygen. Now a collision between two moving rods is much more complicated than a collision between two spheres, because the rods can spin end-over-end in a way that spheres can’t. In fact, I’m not sure that I know how to do the calculations. As the point of the video could be made just as well using atoms rather than molecules, I did the simulation using atoms. If you like, you can think of them as atoms of helium or argon, which do go around on their own.